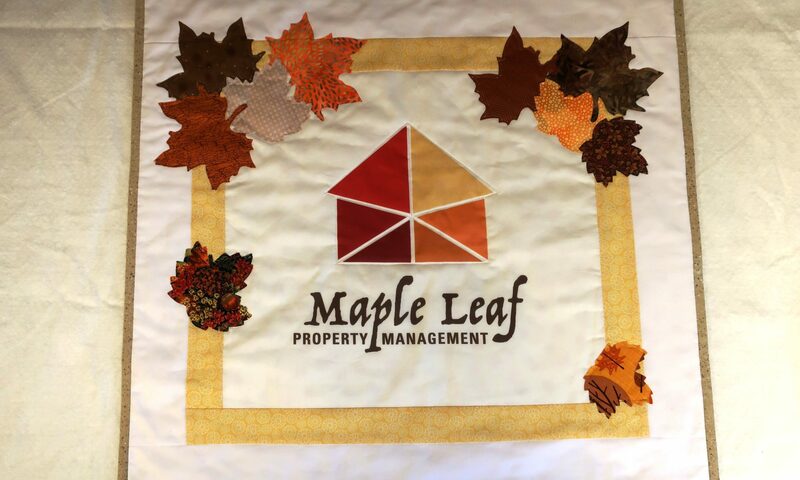 I had fun making this quilted banner for a friend who owns a property management company. Several years ago she had a new logo designed for her rapidly growing company. Ever since I saw it I kept thinking how much fun it would be to make a banner that combined the maple leaf theme with the new logo. This year she celebrated a significant birthday and I knew this would be the perfect occasion. I had the logo printed at Spoonflower which is a company that will do custom printing. It did take longer than I thought to get it back. Nearly three weeks so if I do this again I’ll plan better for that. I had some Accuquilt dies in different sizes to cut the maple leaves. Again, I’ve planned this for a couple of years so had already purchased the dies. I really didn’t know until I started what I was going to do. I was not certain what size the logo would end up and knew that I needed to see it before I could plan the rest. I ended up starting and then letting it sit for a few days until I knew how and I was going to proceed. 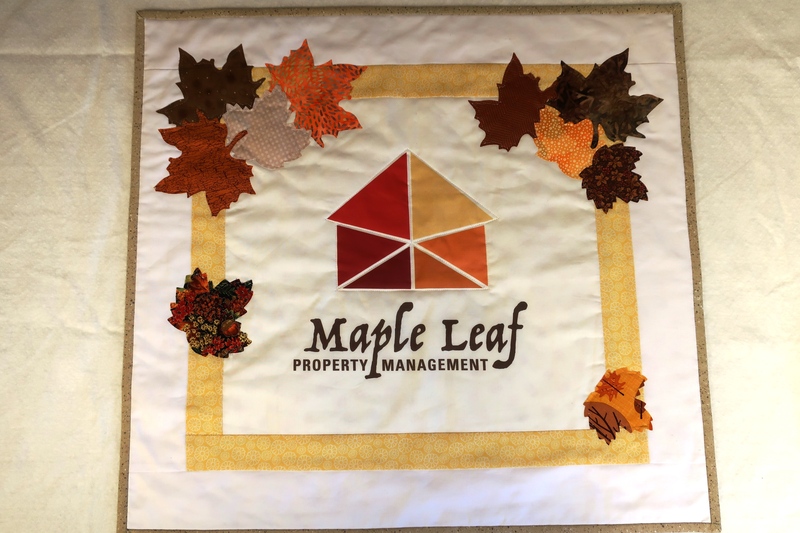 I used a big 161/2 inch ruler to cut the logo, added the borders and then had an assortment of leaves cut and kept moving things around until I got what I liked. I’m glad that I didn’t rush and took pictures along the way because I did change my mind about what I was going to do. The biggest change was in the colored border. Originally I had planned to use a rust/orange but when I took a picture and put in on my computer I realized I didn’t like it and the yellow looked much better. In the end, I was pleased with the result and even put a pocket hanging corners on the back as well as a label with birthday wishes and my name. I rarely label my quilts so this was a first.